The 1965 New York Jets were scheduled in early September to play the Houston Oilers in the air-conditioned “8th Wonder of the World”, The Houston Astrodome. The Jets training camp featured Joe Namath, John Huarte, and myself all competing for the starting QB assignment. The New York Sports Writers feasted daily on the drama of high profile pro QB competition. 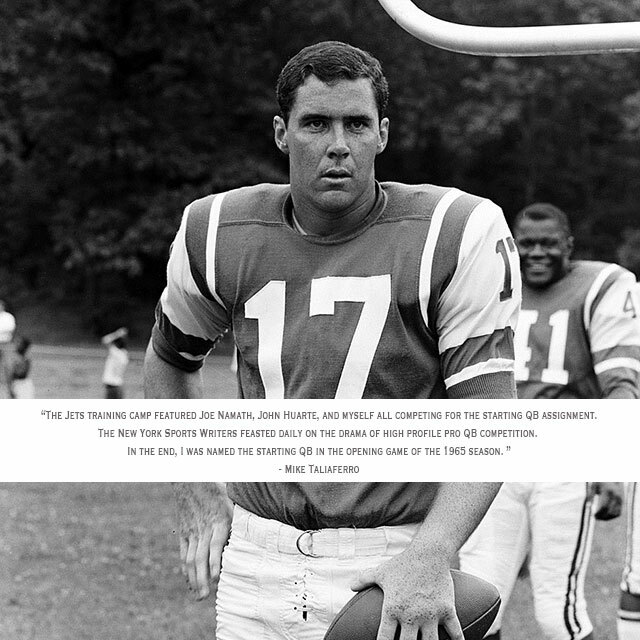 In the end, I was named the starting QB in the opening game of the 1965 season. At the last minute the game was moved from the Astrodome to the Rice University Stadium with opening kickoff set for 1:00 PM. The temperature at game time was 95 degrees and the humidity a sweltering 80%. In 1965 the team doctor and training staff were opposed to players drinking any fluids during a game. I lost 18 pounds in the 2 1/2 hours it took to play this game. As I reflect on the game, I've often wondered why consuming fluids during a game of football was thought to be so ill-advised by the team doctor and trainer.